Two albums have been sent here to review and as one has been released significantly earlier, I will combine them as a whole. First up is the self-titled CD, which opens up ironically with ‘Don’t Panic’, utilising vocal samples and crunching break-beats. It’s a frenetic start and thoroughly engaging from the off that filters into the down tempo ‘Les Americaines’ trudging forward with off-kilter electronics that are competent, but not really engaging the listener as well as it should do. The more exciting aspects of this release are when the breaks are allowed to the mix. ‘Silent Nations’ displays some impression of suspense, whilst the mashing breaks thump away over the top; this is where Shhh… shines most. Overall this is an interesting release, nothing that will set the world on fire though. I do feel more attention should have been paid to the production surrounding the breaks. They do punch and they most certainly kick, however the do lack the clarity that would have made them truly bombastic. ‘Low Lights’ had me intrigued from the packaging alone. The digipak is wrapped in a type of glass paper; excellent, although I am sure this is going to be a nightmare on the shelf next to other releases when it tears their covers to bits. Nice. 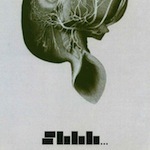 ‘Junk Kick Baby’ is an improvement on the last release all on its own; the hook ridden grinding bass line is excellent over the subtle power noise rhythms, but should have been used a lot more; although redemption does come in the form of some crushing trademark break-beats. ‘Conflicts and Resolutions’, is an upbeat surging blast of wire electronics and feedback that crush away over a simplistic rhythm and utilises a power electronics ethic. This clever mash of styles is one of the more effective tracks I have heard from this artist throughout both albums and shows a genuine flair for mixing genres. Another element of ‘Low Lights’ that makes it stand out is the knack of switching at will from ambient to all out dance-floor power noise, as the dramatic change over between ‘Slow Room’ and ‘Weak Signal’ attest to. Generally this is all over better album than the s/t; the production has been tweaked marginally and makes for an all out better listen overall. 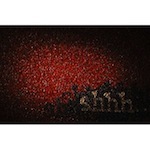 Shhh… is definitely one for those that like their music with a slightly obscure edge making for a more eclectic listen. This entry was posted in Thisco. Bookmark the permalink.